Note: The following is a guest post by Tableau Zen Master Tamas Foldi. Managing a group of Tableau consultants who want to satisfy demanding customers is an exciting job. As Tableau helps people understand their data, we help them do it in the most efficient and elegant way. Sometimes this involves heavy customization. We might add beautiful tailor-made chart types. Or we might get the dashboard's underlying and summary data in multi-sheet Excel workbooks. Sometimes we even provide a real-time interactive experience by manipulating the data and integrating with external business applications—all directly from the visualisation itself. We leverage Tableau 10's feature-rich APIs to handle that last request. They provide a simple way to combine custom workflows with Tableau's unparalleled visualization capabilities. The most sought-after requirement is to extend collaboration capabilities with cross-device data annotation and database write-back features. This way, decision makers and analysts can stay right with the data and start asking deep-dive questions in context. Even enterprise workflow tools can be extended in an agile way by directly feeding them the data from visualizations. 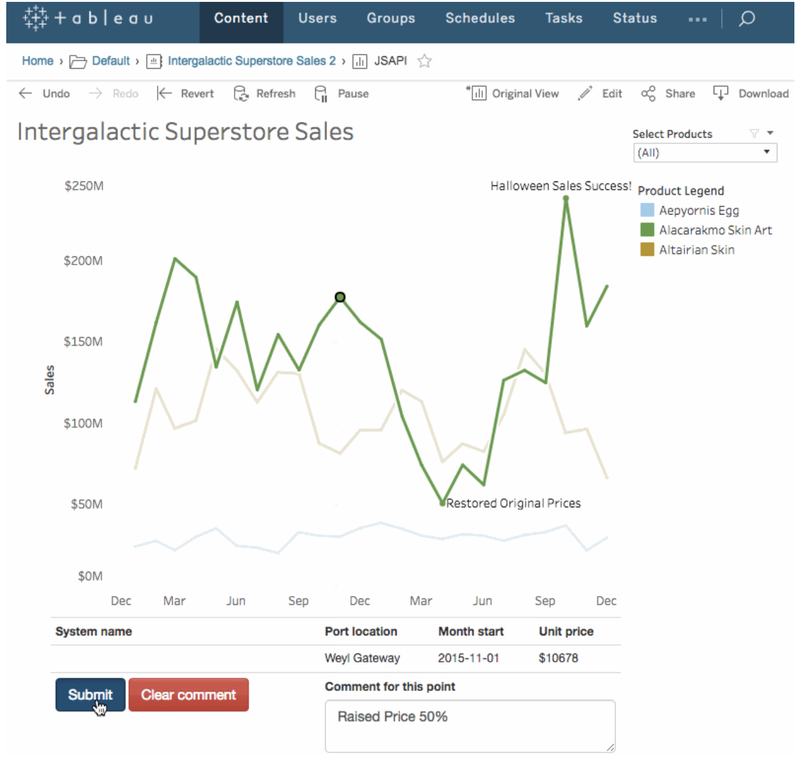 Interactivity has generally been the hallmark of Tableau’s visualizations, and getData() takes this interactivity to a whole new level. By selecting the data point on the visualization, you can add a comment. All details in this prompt are provided by the getData() API call already. The project uses a couple of black-belt techniques to achieve a seamless integration between the Tableau Server VizPortal and our interactive dashboard. But this is just one example. Since the API covers all interactions from data filters to mark selection events, the possibilities are endless. All technical instructions on how to build and deploy this sample project are available on GitHub. How are you using Tableau’s new getData() feature? Let us know in the comments below. For more tips, tricks, and vizzes by Tamas, check out his Tableau Public profile page and his blog. You can also connect with him @tfoldi. What is the best way to deal with a spreadsheet that does not have column headers in the first row or uses multiple rows for the various column headers? Hello,the information you provided in this article is very useful.As a newbie, i learned a lot from your blog.The information you provided on this blog is worth and very useful for the beginners.Thank you very much. The most sought-after requirement is to extend collaboration capabilities with cross-device data annotation and database write-back features.